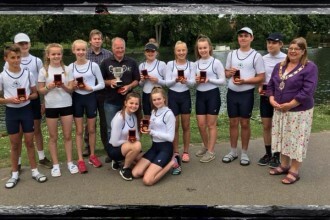 Ten members of Henley Rowing Club’s highly successful Junior Women’s Squad travelled to Nantes over the weekend to compete for Great Britain in the annual regatta against France. The Henley crew of Florence Wiggins, Lauren Edwards, Maddie Orr, Ellie Thompson, Hattie Orr, Clare Pearson, Ella Morgan, Lily Stimpson and cox Rebecca Lister had qualified to row as the GB eight after a series of gruelling time trials at the end of June. 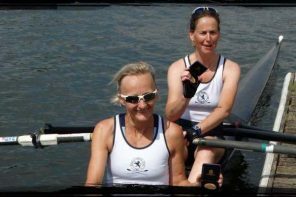 Accompanied by Emma Lister as spare rower, the Henley girls had travelled to France with the GB squad several days before the regatta to prepare themselves for their first international honours. Rowing in a Warranty Direct supported Hudson boat that had already won the Schools’ Head, Women’s Head, and the National Schools Regatta this season, the expectations on the girls were extremely high as the junior women’s eights race was the opening event in the regatta and had in previous years been dominated by the French squads. The GB crew were fast off the start of the 1500m course along the river Erdre and they showed the desire to command the water over the French boat with a canvas lead in the first 250m. As they reached the half way mark the Henley girls pushed on further ahead to lead by over a length. By the time the GB boat reached the regatta enclosure they were a clear length and a half in front, giving rise to loud cheers from the entourage of GB supporters who had made the long journey to support the squad in France. The French eight, renowned for their fast finishes, raised their rate significantly as they rowed past the enclosure into the final 250m to try and regain the lead. 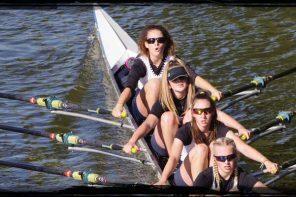 The Henley girls responded with a clear determination to win, and with commanding composure, powered ahead to extend their lead to 2 lengths. 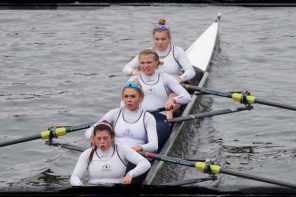 As they crossed the line, the Henley girls were jubilant to score the first victory of the regatta and their racing performance set the tone for the subsequent 12 events.